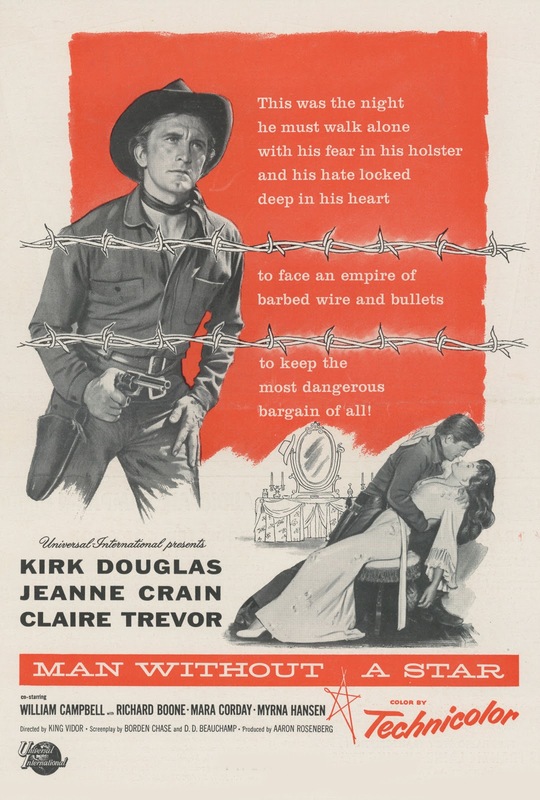 Peach of a mid-fifties western Man Without A Star has gone so-far unreleased on US disc, odd for the fact Universal offers many not nearly so good. There's been a Region 2 from France with locked-in subtitles, and lately a UK offering that gets everything (finally) right. 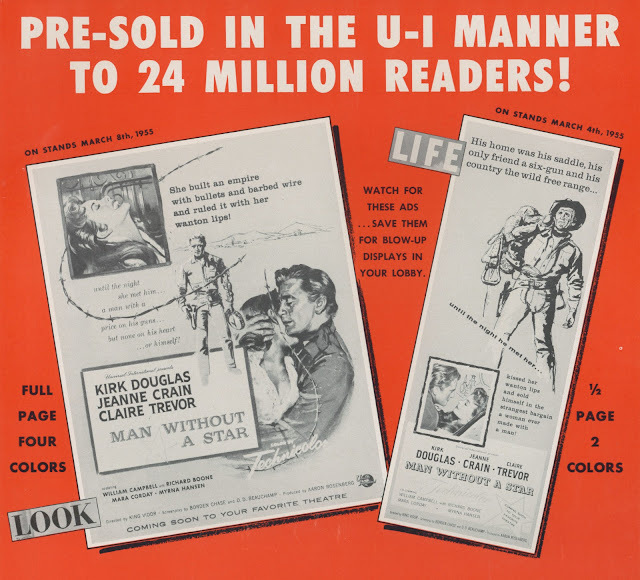 MWAS was a star-driven "A" where Kirk Douglas swapped 22 days of his time for half of profits Universal took. KD had left agent Charles Feldman for MCA and strongman Lew Wasserman, which got him in the 50% club with James Stewart, Gregory Peck, other male leads (also MCA clients) whose names assured grosses. That Man Without A Star emerged a ripping western might be thanks to director-since-forever King Vidor sprung from relative inactivity to work well and efficiently on Universal-International's time clock, as good a 50's place as any for master filmmakers less wanted elsewhere (ask Orson Welles). Evidence suggests the stars got what was bargained for re U-I profit-splitting. Richard Widmark told interviewer Michael Buckley in 1986 that he was still cashing checks for 1956's Backlash, "and it's no good," Widmark added, "... imagine what these guys who made good movies on that deal are getting" (said three-part Films In Review career talk is the best with RW I've come across --- worth seeking back issues to read). 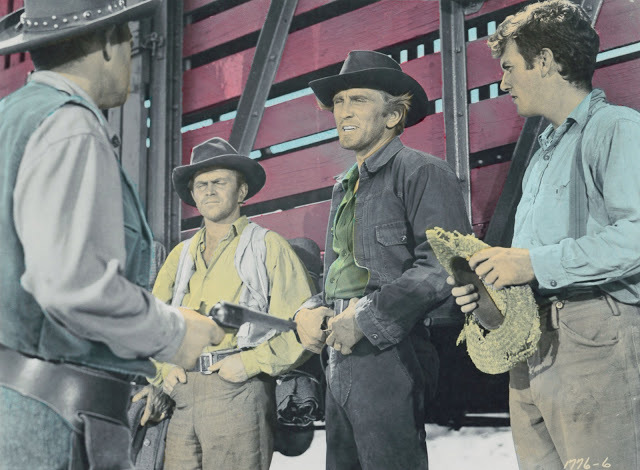 Kirk Douglas, however, gave conflicting accounts of his pay-out for Man Without A Star. Autobio The Ragman's Son claims the fifty-fifty deal for Man Without A Star "sounded great. Was great --- for the studio." Douglas acknowledged having made "a little money" from MWAS in his 1988 book, but expressed wariness over Universal bookkeeping and distribution of their partnership film, clear implication U-I kept loot rightfully Kirk's. This was stark contrast to a letter the star wrote United Artists in 1961 where he excoriated brass for failure to pay up percentage for The Vikings, completed three years earlier. Tino Balio has the following excerpt from Douglas' correspondence in an excellent survey, United Artists: The Company That Changed The Film Industry: "A few years ago I sneaked in a little picture for Universal-International called Man Without A Star. I shot it in four-and-a-half weeks. Did a great deal of work on the script myself," wrote Douglas, much closer to the event, "So far I have earned over $600,000 on this teensy-weensy picture." 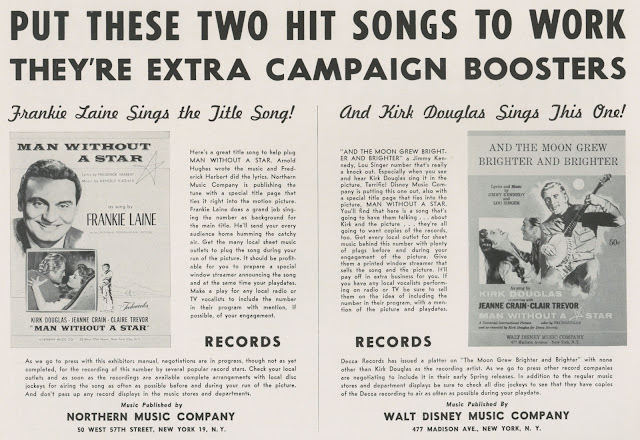 Variety wrote on October 25, 1955 that KD "received his first check last week" for Man Without A Star, and that the star's own estimate for ultimate pay-out was half a million. Could Universal have shorted a major name with all-powerful MCA and Lew Wasserman hovering? Based on what's been told of that agency's near control of U-I, this just a few years before they bought the studio, it seems unlikely. MCA was delivering bigger names to Universal than had ever committed there before. 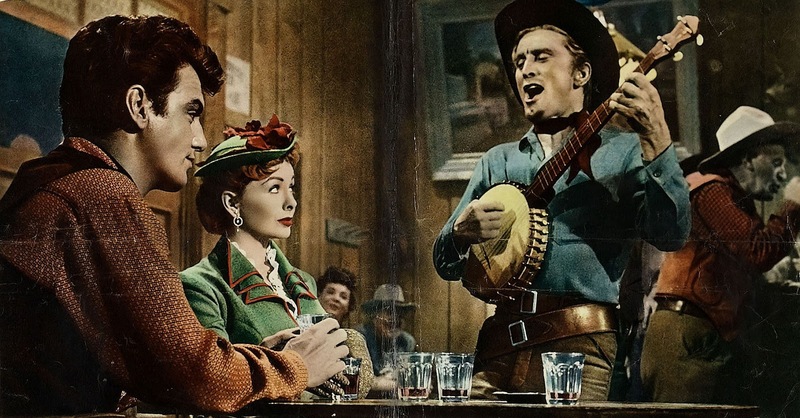 In addition to James Stewart's remarkable take for Winchester '73 (at least $600K --- some say far more), there was Tyrone Power's $750,000 for The Mississippi Gambler. Both these, plus Errol Flynn, Alan Ladd, and aforementioned Gregory Peck, were represented by MCA. To shortchange one would have risked all. These lead men profited greatly on formula, action-oriented shows Universal was ideally equipped to produce, and thriftily, which put break-even bars lower and participation checks out sooner. Features like Desert Legion, Against All Flags, The World In His Arms, and Man Without A Star wouldn't rank among their stars' best, but for paydays had, added up to time very profitably spent. On the Vidor topic, Douglas tabbed his hiring as an act of charity: "Ray Stark pleaded with me to give his client King Vidor, a chance." According to KD, Man Without A Star's director was often late to work, then sat around talking about "the good old days." It's overall a withering impression, one that might have cost Vidor War and Peace had Douglas issued such quotes in 1955. You wonder where accuracy lies in these look-backs. Vidor had been gone six years when The Ragman's Son was published. Was his a meaningful contribution to Man Without A Star? 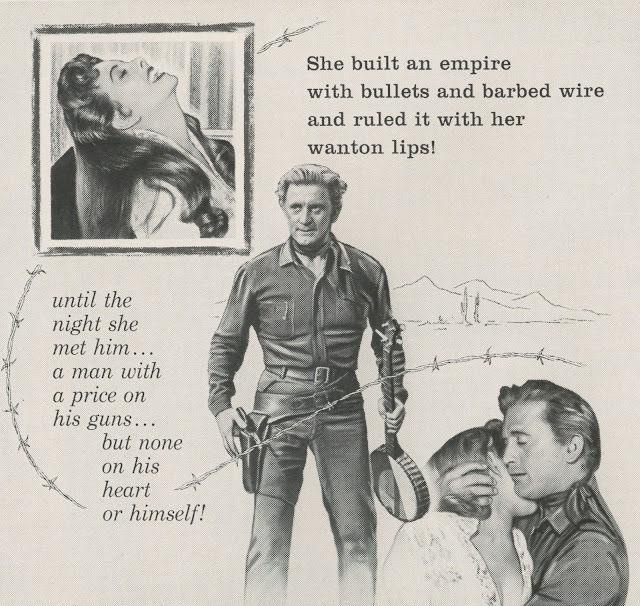 Script and preparation was mostly in the bag by the time he arrived to direct, and certainly Universal was well-oiled to churn this sort of western. It's tempting to say Jerry Hopper or George Marshall could have done as well, yet there are moments ... one in particular with foreground guys awaiting a distant train that I'd swear Sergio Leone lifted wholesale. 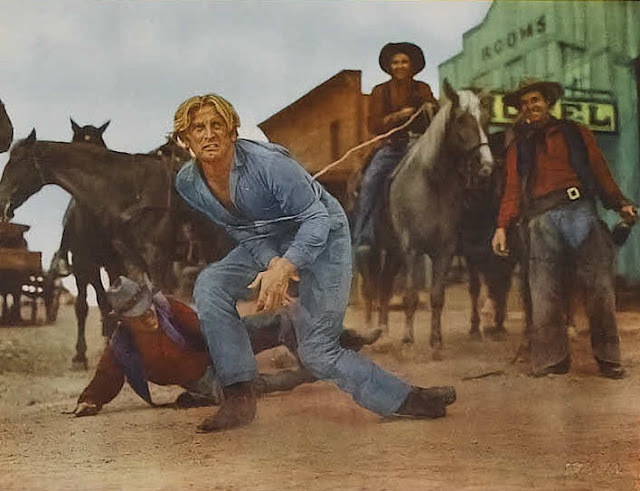 Kirk Douglas does his amiable cowboy here. There are toothy grins, tight wardrobe (his, not the ladies'), and a song KD-warbled. Howard Hawks had warned that the actor was less effective playing nice, let alone comical. That had partial-sunk The Big Sky. 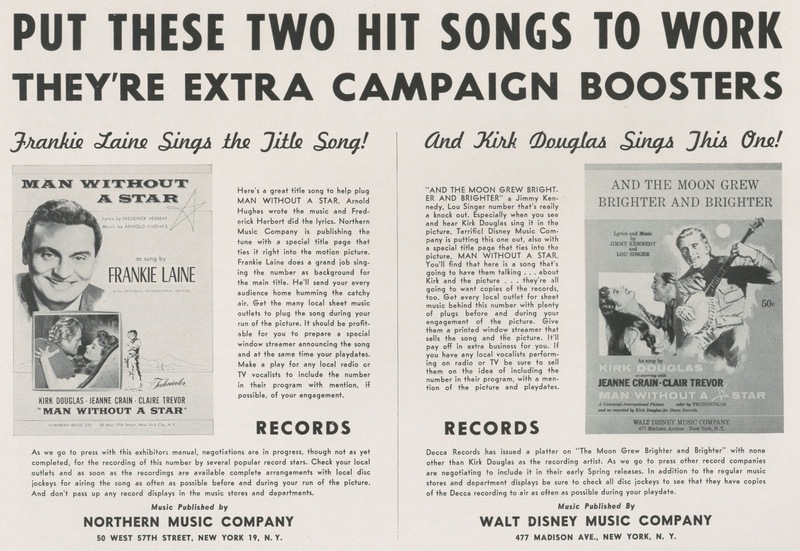 Douglas recorded And The Moon Grew Brighter and Brighter along with 20,000 League's Whale Of A Tail in July, 1954, tie-ins for respective pics and both sheet-published by The Walt Disney Music Company. The Moon Grew Brighter and Brighter is an OK tune, performed by Douglas with signature gusto, even if it midway-stops Man Without A Star cold. By the mid-fifties, vocal themes, preferably by Frankie Laine, rocked the cradle of big-studio westerns, and U-I wasn't shy besides at using music talents of he-men on payroll to sing (or compose) tunes. Jeff Chandler was another U-I star capable at both and recorded for Foxfire's main credits. Such tie-inning was valuable what with home media (radio, TV) implanting theme songs to patron consciousness well ahead of playdates. Hope this makes it past. Super article John. Haven't seen this yet. Not sure if you remember, but Kirk bought his golf slacks from me at my pro shop in Mission Hills...size 28, yep, I said 28. We started that after Gibbons invited Tony Martin, (long time friend), and Cyd Charisse to have dinner with us at Jack London's....we had already been seated. So, Dominique the bartender's wife, (they later purchased the restaurant), had the guys bring another table and we all had dinner together...Kirk was with them. He learned where I was and I told him I had a very small stock of 28s, but he came anyway and asked if I could wait on him personally. I did then, and each time he came in to get the new ones I ordered especially for him. just saw where he is 95 and saw a pic of him serving meals to the homeless recently with his wife of 58 years or so. Going to try to get in touch with him for my book.